The historical or mainline churches have increasingly larger percentages of older adults as congregants. They are characteristically vibrant and committed. In contrast, there are proportionally fewer younger adults or children active in the church. 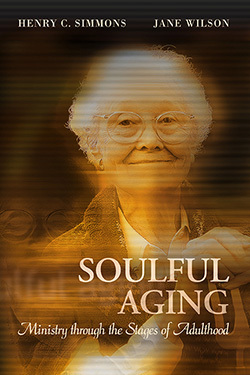 The older congregants in the last third of life can offer much by speaking about their lives, their spiritual journeys, and their hearts and souls. This book is about cultivating an informed conversation, cultivating some of the most important religious realities of life. There are six chapters, each tied to one of the six stages of aging: Extended Middle Age, Ready or Not, The New Me, Like It or Not, The Rest of Living, and Dying. Each chapter looks at the pathways to personal and communal spiritual growth—community, prayer, teaching, proclamation, service, and witness. For each stage of life, the authors conclude with a short read and a suggested pastoral strategy for group discussion or sermon preparation. Henry Simmons is Professor of Religion and Aging and Director of the Center on Aging of Union-PSCE, where he has taught for 14 years. He graduated from the University of Ottawa, Canada, in 1970 with a PhD in Psychology and Religion. He taught previously at the Toronto School of Theology in Toronto, Ontario, Canada, and Garrett-Evangelical Theological Seminary in Evanston, Illinois. He is a Charter Fellow of the Association for Gerontology in Higher Education, and a nationally known teacher on religion and aging. An ordained minister, he has been a full-time seminary professor for 29 years, teaching in the areas of spirituality, adult education, ministry with older adults, and congregational analysis. Jane Wilson is the interim Associate pastor at Fountain Hills Presbyterian Church in Fountain Hills, Arizona. She has served two churches in Ohio. Prior to ordination in 1998, she worked for the federal government in Washington, DC.